If you want to make your photos, videos, audio files, and text documents available to others, your best bet is to manage this multimedia content with special software. Four programs can help you create, publish, and share these digital assets. Most users can find their way around data collections with no problem. They arrange their photos, videos, audio files, and documents in a directory structure that they can still understand later. However, as soon as a team requires access to multiple digital assets, a system is needed that everyone can cope with. Tags, preview, search, and filter functions help with orientation. Digital asset management (DAM) systems store and publish media content, allow data and metadata to be processed, secure resources with ACLs, offer version control in some cases, convert files into other formats, and link them with other content. DAM software is available for different target groups. The market is bustling with smaller systems aimed at marketing and creative departments, programs for huge collections such as those in museums, libraries, and archives, and complex B2B systems that control the workflow between suppliers and companies. We tested four smaller solutions: two for your own LAMP server and two cloud services. In the latter case, the test team chose providers with a fixed price model. Phraseanet  and ResourceSpace  are open source, and they take on the two commercial candidates Razuna  and Smartimage . We investigated which file types the programs import and export, the comfort of handling metadata, and whether they offer a mass tagging function and version control. We also tested the search and filter functions and the user and group management. Phraseanet and ResourceSpace proved themselves on an Amazon EC2 micro instance on Ubuntu Server 14.04 (64 bit) with Apache, MySQL, and PHP. Approximately 5,000 photos in JPEG, PNG, and Nikon RAW (NEF codec) formats and a few documents (PDF, LibreOffice Writer, and MS Word) were moved onto the servers in the test. In some cases, the images contained metadata added by the cameras or the digiKam photo management tool. Firefox 32 and Google Chrome 37 provide access from the outside. The first test candidate comes from the French software house Alchemy . Phraseanet  has been available for download since 2010 under the GPLv3 via GitHub. We installed version 3.8. Before installing, admins should take a look at the documentation  to prepare their own server. Phraseanet requires several tools in addition to the LAMP environment, including the PHP modules curl, JSON, GD, Exif, gettext, and Twig. Tools such as ImageMagick, UFRaw, FFmpeg, Ghostscript, Xpdf, SWFTools, unoconv, and MP4Box, as well as the phpdev development environment and a compiler are required. If you accidentally make a typo or enter something else, you'll experience unpleasant surprises later, and some content will remain invisible. After installing the indexer, users can configure the locales on their server so that Phraseanet talks to them in a language other than French. then installs the application. The Phraseanet bin/console tool supplements the Apache configuration with the required sendfile and streaming entries. The documentation  lists all the necessary commands. After logging in to the web interface, the admin can select the system language and launch the individual tasks in the Task Scheduler section. The Phraseanet interface is available in French, German, English, and Dutch, but the translations are incomplete. The interface is a also a little awkward to handle; it is divided into seven modules – depending on the user's authorization – which are normally opened in a new browser tab. Production contains functions for importing, processing, searching, displaying, organizing, and sharing content. According to the manual, Classic is the interface for visitors who would like to view and download files. Lightbox serves as a common interface that allows access to files and reviews by others. 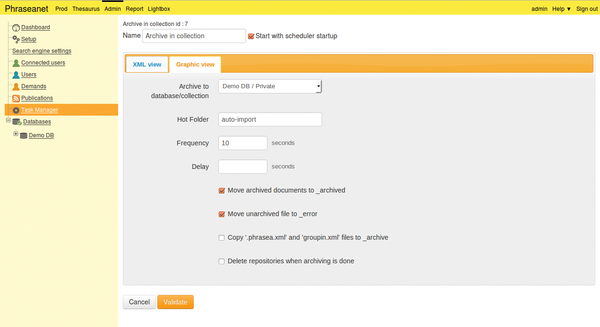 All functions for managing, generating collections, and for document structures are assembled in the Admin section. The Upload module can only be reached from the Production interface. By default, the DAM system uses an HTML5 uploader that did well in the test. If you encounter problems here, review the entries for upload_max_filesize and post_max_size in the file php.ini. Phraseanet developers recommend setting both values to 200MB. A Flash uploader is available as an alternative for users who use a browser without HTML5 support. Phraseanet searches for duplicates based on UUID checksums and highlights these when uploading. Users can find the files on the Quarantine tab and decide whether they want to add, delete, or replace the resource. The software supports many file types, including popular photo, graphic, video, and audio formats, vector graphics, PDF, and Open/Libre Office and Word documents. Selecting entire directories is not possible, meaning that users have to select their data by hand. The data appears afterward as a preview on the left side of the interface. You can change the order using drag and drop (Figure 1). Previewing Office documents will not currently work on Debian-based servers because the pdf2swf tool is missing in the SWFTools package . If you're missing this feature, you can build SWFTools from the sources. Figure 1: Users can re-sort the order of their files (left-hand side) in the Phraseanet HTML5 uploader before uploading. You can see the progress on the right-hand side. As the only candidate in the test, Phraseanet monitors directories specified by the admin and automatically imports new files. After creating the folder, users should create an empty file there called .phrasea.xml and then turn to the Admin module and its Task Scheduler menu in the web interface. This function has a somewhat cumbersome name of Archive in collection . The task is stopped by default. Users can edit the configuration, enter the collection name, the Hot Folder , and values for observation (Figure 2) by clicking the small arrow. The service starts after clicking Confirm . Figure 2: Phraseanet monitors directories in predefined intervals via the Hot Folder and automatically imports new files. Phraseanet differentiates between collections, which it manages under Admin | Databases , and baskets, which users create in the Production module. Selected files can be dragged from the right workspace and dropped into the basket on the left-hand side. The baskets open by clicking on the arrow and show their contents along with a few icons on the upper edge, which export, print, edit, move, and publish the files. New baskets can be created using the triangle ruler and pen icon at the very top. The menu also provides functions for searching baskets, sorting them, or generating reports. The gearwheel icon opens the Tools dialog. You have options here to rotate all images in the selection. 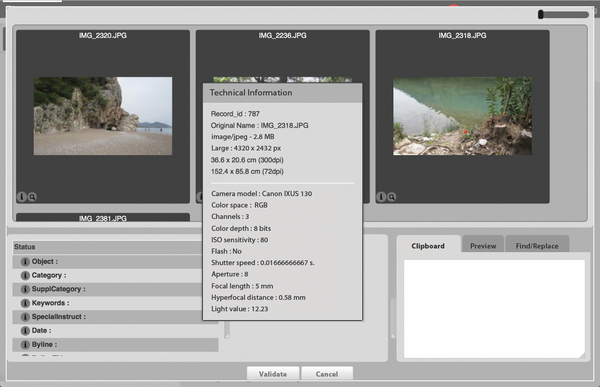 Phraseanet uses the Exif tool for metadata management of images. The DAM software reads existing Exif, IPTC, and XMP information as well as the keywords and geodetic information (Figure 3) during the import. Users need to select one or more objects in the basket and press the Edit icon to add new tags. Then, click on Keywords in the lower section and enter the tag on the right in the box. Figure 3: During importing, Phraseanet reads all EXIF, IPTC, and XMP information and stores the metadata to the images. Let users recover a deleted file without admin intervention by aliasing the rm command with mv or by writing your own script that moves the data to another location.